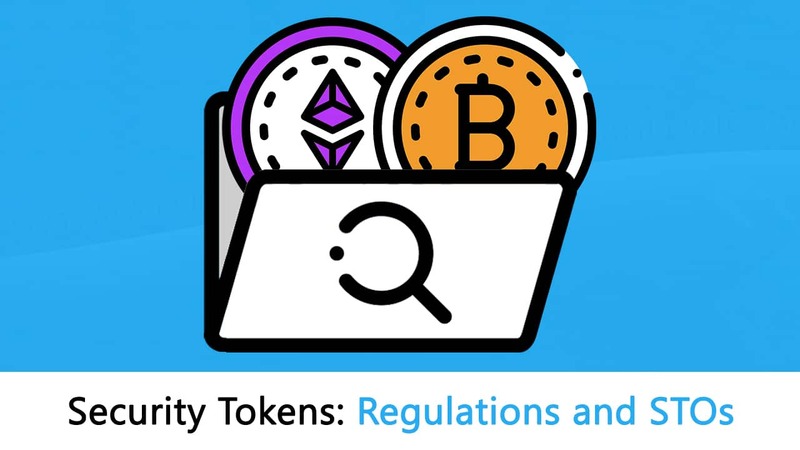 What Regulations Are Security Tokens Subjected to? “Security Tokens Explained” or “STOs” is the big topic of the week. There is a chance that they may completely outperform ICOs in the coming year. So, what are STOs and how do they work? Let’s find out more in this article. When ICOs first started out, they revolutionized the concept of public funding and crowd sales. Usually, in IPOs or Initial Public Offerings, a company needs to go through a lot of red-tape in order to qualify for a public sale. However, ICOs disrupted this system by allowing developers to collect millions of dollars in exchange for just a white paper. Then, the developers will create a white paper. A white paper is a document issued by the developers which highlight their project and the specific features of that project that makes it enticing for the potential investors. While it is true that white papers are supposed to be a sales and marketing tool, they are nowhere near as flashy and over-the-top as a brochure or a sales letter. Whitepapers are written in an academic manner and the specific purpose is to entice the investors by showing its potential and features. They are meant to be purely informational. Now, they will need to create the tokens which they are going to exchange for Bitcoin or ETH in the token sale. Developers will have to decide the limit to the number of tokens and the amount that they want to charge for each token. Usually, the price of these tokens is very low at the start of the ICO. Setting a cap on the number of tokens is necessary because having a limited supply of tokens automatically increases their demand (according to the law of supply and demand). Along with the cap on the number of tokens issued, developers will have to decide a time at which they want to hold their ICO. Selecting the time, and the amount of time it runs for is critical and this will be covered in detail later on. Along with that, they also need to decide on the cap for the amount of money they will be taking in. Once all these are decided, the developers choose a platform where they can advertise their ICO. The sale is a pretty simple one. If someone wants to buy the tokens they send a particular amount of ether to the crowd sale address. When the contract acknowledges that this transaction is done, they receive a corresponding amount of tokens. Since everything is decentralized, an ICO is considered a success if it is properly well-distributed and a majority of its chunk is not owned by one entity. In 2017, ICOs raised $5.6 billion while in 2018, they raised >$20 billion. ICOs have raised so much money that they have invariably attracted tons of scammers as well. In fact, the number of scammy and bogus ICOs have increased so much that it has affected the overall value of the global ICO market. Since the actual requirements of creating ICOs are so non-existent, it is very easy for literally anyone to create an alluring white paper and raise millions of dollars with little-to-no accountability. Ponzi Schemes: Remember Bitconnect? Bitconnect was one of the most infamous Ponzi schemes of all time. A Ponzi scheme is similar to a pyramid scheme where it generates returns for older investors, provided they acquire new investors. It promises a high rate of returns with little to no risk. If you think that this is a little too good to be true, well then, that’s because it is. The Ponzi scheme is one of the oldest scamming methods known to us, however, investors continue to fall prey to them. Many scammers have taken advantage of this gullibility to leverage Ponzi schemes in their favor. Front Running: In this case, a company or individual buys a large chunk of the tokens before any other investor even gets the chance to do so. The moment the price of the tokens goes up, they immediately sell everything. Pump and dump: This happens when a group of traders colludes beforehand to buy a bunch of tokens and drive their price up high before selling them all in exchanges. This is one of the most common scams in the crypto world. This is called a “pump and dump”. Washed Trades: In this case, a group of investors just keep trading tokens between them in order to create an illusion of asset liquidity. All in all, the ICO world has been something akin to the “wild west”. With the lack of regulations and red tape, we have had amazing success stories, such as the Ethereum ICO while we also have had outright scams such as Bitconnect. However, in order to safeguard the interests of the investors, regulations have entered the market and created a new type of token offering to make the token issuers more accountable for their actions. 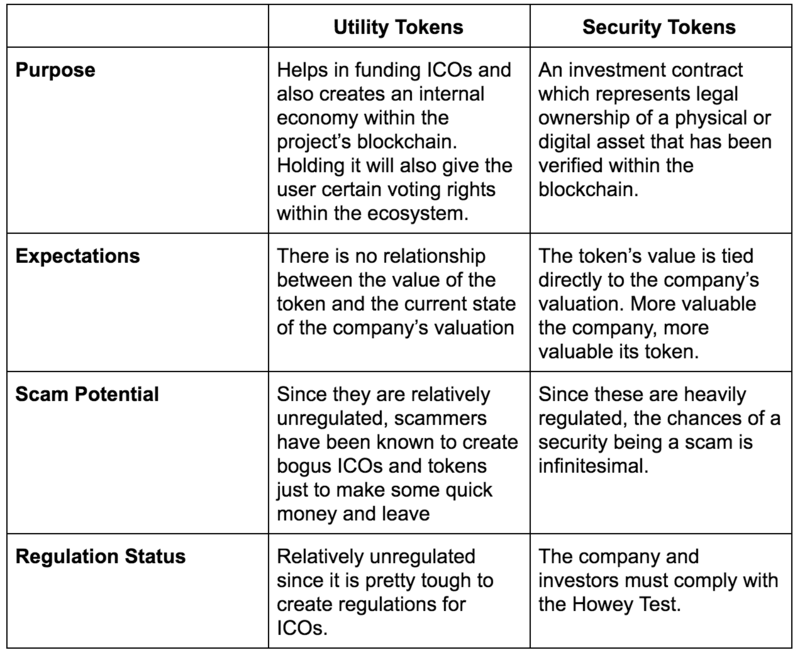 These offerings are known as security token offerings. STOs, like ICOs, are fundraising tools, however, they have certain regulations which hold the token issuers accountable for their actions. Unlike the regular utility tokens, STOs generate “security tokens” which are real-time digital assets that operate within legal boundaries. So, to understand STOs, you need to look into what a security token is. A token is classified as security when there is an expectation of profit from the effort of others. If the ICO doesn’t follow certain regulations, then they could be subject to penalties. However, if all the regulations are properly met, then these tokens have immensely powerful use-cases. At its very essence, a security token is an investment contract which represents legal ownership of a physical or digital asset like real estate, ETFs etc.. This ownership must be verified within the blockchain. Having said that, the true value in security tokens lies in how they can completely redefine the meaning of “ownership”. They can democratize assets and distribute them among people all over the world. To give a very crude example, instead of owning a gold coin, which may be out of a lot of people’s budget, it is now possible for 100 people to own fractions of that gold coin. Anthony Pompliano does an admirable job of explaining the kind of regulations that security tokens will be subjected to in this article. Regulation D will allow a particular offering to avoid being registered by the SEC provided “Form D” has been filled by the creators after the securities have been sold. The individual who is offering this security may solicit offerings from investors in compliance with Section 506C. So what does Section 506C require? It requires a verification that the investors are indeed accredited and the information which has been provided during the solicitation is “free from false or misleading statements. This exemption will allow the creator to offer SEC-approved security to non-accredited investors through a general solicitation for up to $50 million in investment. In order for the requirement to register the security, the issuance of Regulation A+ can take a lot more time compared to other options. For the same reason, Regulation A+ issuance will be more expensive than any other option. 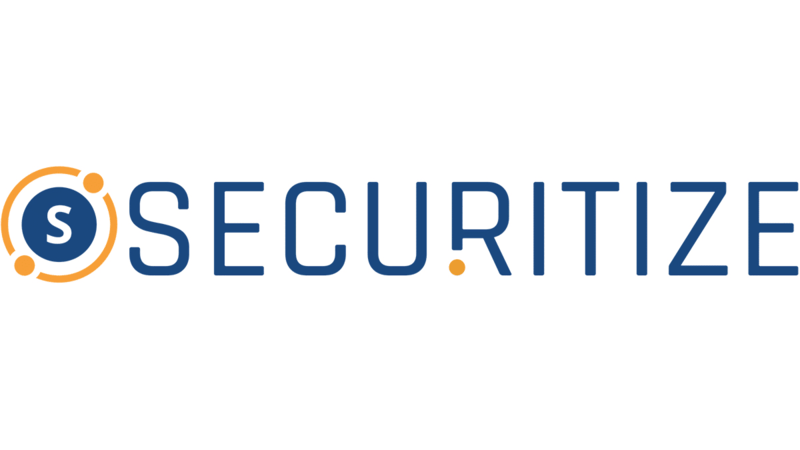 This happens when a security offering is executed in a country apart from the US and is therefore not subjected to the registration requirement under section 5 of the 1993 Act. The creators are still required to follow the security regulations of the country where they are supposed to be executed. NOTE: As Anthony Pompliano notes in his article, the above summaries are merely his interpretation. They should not be construed as legal or investment advice and you should consult a lawyer for any and all questions you have. If you are interested in diving deeper into the laws and regulations associated with blockchain and STO’s, check out our Blockchain for Law Accelerator Program! So, why have STOs garnered so much attention? If you market your business effectively through an STO platform, then it can be an extremely powerful and effective tool for raising capital. Since a Security has to go through so many regulations, you know for sure that your investment is in the right hands. An ICO investor gains profits on their investment via the use of the company’s platform or by the appreciation in the value of the token. However, an STO investor’s investment value is directly tied to the value of the company, They gain cash flow in the future and gain potential dividends or any potential right to vote that comes with the security. Since security tokens are backed by external assets, it gives them value as soon as they are issued. Utility tokens, on the other hand, gain value by mere speculation until the platform that it is based on is developed. An ICO is more like a Kickstarter or a “Go fund me” campaign, while securities are more like professional stock options. STOs can seriously improve the crypto market’s image when it comes to crowdfunding. They can create dedicated black and whitelists that help in assisting with the anti-money laundering and know-your-customer regulatory requirements. Security tokens are tied to real securities which mostly represent tokenized assets. As such, they are a lot more stable and credible than ICOs. Since security tokens are already compliant, they don’t need to suffer from government interference in the future. The protocol is the underlying technology on which a particular project is built. Eg. Golem’s protocol is Ethereum. While ethereum still remains the most popular protocol with thousands of developers and contracts running on top of them, there have been many more protocols that have entered this marketplace. We have protocols like EOS which has become extremely popular with gaming and gambling DApps. In a more technical sense, they are code created on the protocol which serves as a blueprint for the decentralized application. 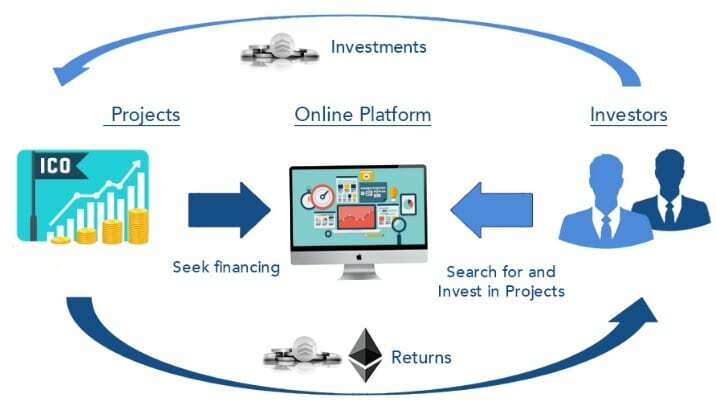 Polymath is a blockchain protocol that helps in the issuance and distribution of legally compliant token-based securities. It helps in streamlining the process of launching financial products on the blockchain by making sure that the new security tokens are financially secure. On the Polymat platform, you will be able to trade security tokens, authenticate investors, connect with legal delegates and access a developers’ marketplace. The native token Poly helps fuel this system. Harbor is an open source platform that helps in the seamless migration from traditional investment classes onto the blockchain. They provide for a Reg D-compliant private sale which integrates KYC/AML, tax rules, reporting information, and accreditation status into each new token formulated through the system. Establishing the legal and regulatory readiness of the issuers and their legal team, streamlining investor registration in compliance with KYC/AML accreditation or other legal requirements, customizing smart contracts to match issuers’ unique requirements and security token data throughout the lifetime of the security. Fiat to Crypto exchanges helps you buy Cryptocurrencies in exchange for Fiat money. Coinbase is a perfect example of this kind of exchange. Coinbase helps you buy BTC, BCH, LTC, and ETH in exchange for Fiat currency. Then we have the Crypto to Crypto exchanges. These exchanges help you exchange certain cryptos like BTC, ETH, BCH etc. for other cryptocurrencies. Binance is a fine example of a crypto-to-crypto exchange. Before we go any further, we need to give a shoutout to this article for all the stats. (Note: The graphs were calculated till October 2018). In the graph above, from Jan 2018 to October 2018, the number of STOs per month has pretty much steadily grown from month-to-month. As the crackdown on ICOs has increased, the shift from ICOs to STOs has been pretty noticeable. 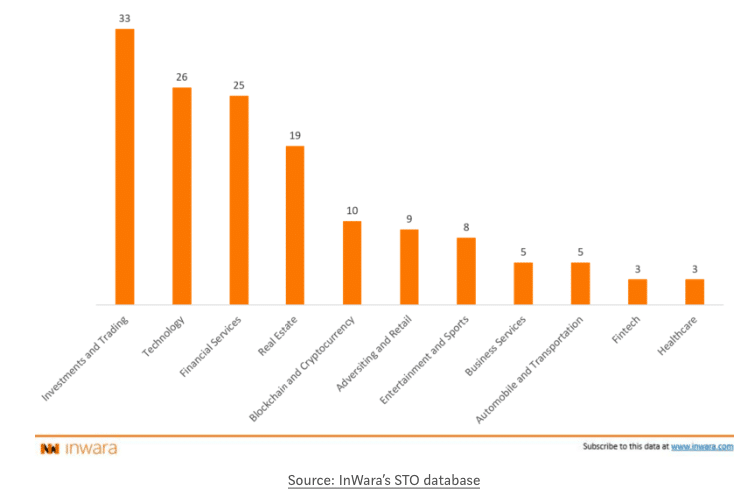 The industry with the most STO is “Investments and Trading” with over 20% of the total market. Following this are “Technology” and “Financial Services”. Funnily enough, financial services led the pack in ICO numbers. Unsurprisingly, ERC20 leads this with a comfortable 68%. 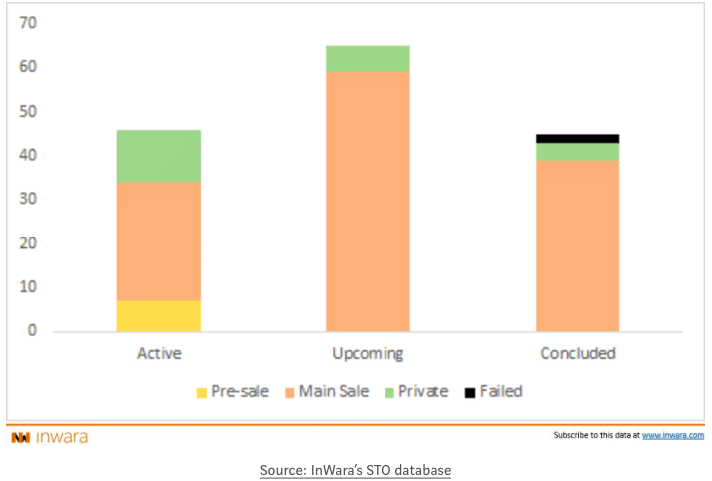 Until October 2018, 99% of the STOs were successfully completed. Fully licensed exchange platforms will now soon be available for security token trading. This will significantly increase trading confidence because of the added credibility. Since a real-world asset can be represented via security tokens, it will enable investors to liquidate security tokens against any product. In the non-crypto world, only a handful of companies go public because that transition requires a lot of money in the first place. As such, investors have the option of buying the shares of a very few companies. However, STOs, on the other hand, can be started right away since they are a lot cheaper than public companies. They reduce costs by completely removing all the middlemen. Also, having more STOs will allow more people to invest in the shares of more companies. Like we have mentioned before, security tokens will make high-priced assets a lot more accessible for the common man. Security tokens can easily segment an asset into smaller sub-divisions making it possible for an investor to own a fraction of the asset instead of the complete product. 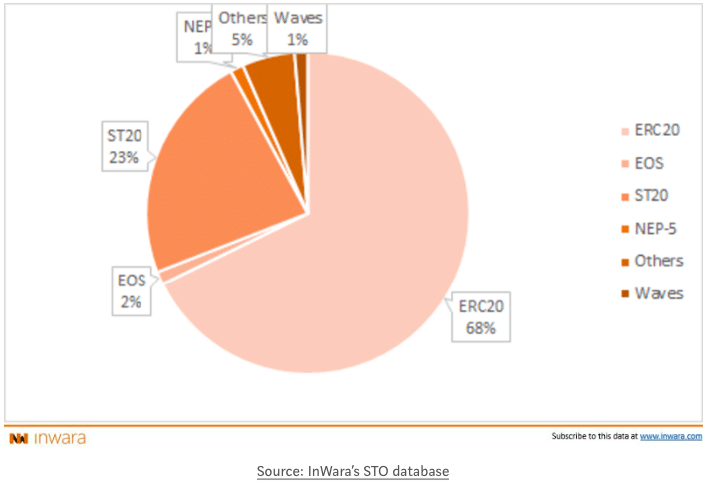 As you can see, STOs may become the preferred mode of crowd-funding in the near future. They are a lot more regulated and secure than ICOs while being a lot cheaper than IPOs. STOs also has the potential of opening up asset-ownership to a wide variety of people. Keeping all these things in mind, you can see why STOs have garnered so much hype? Can they live up to it? Well, we will need to wait and watch. Want to learn more about Blockchain Law’s and Regulation?